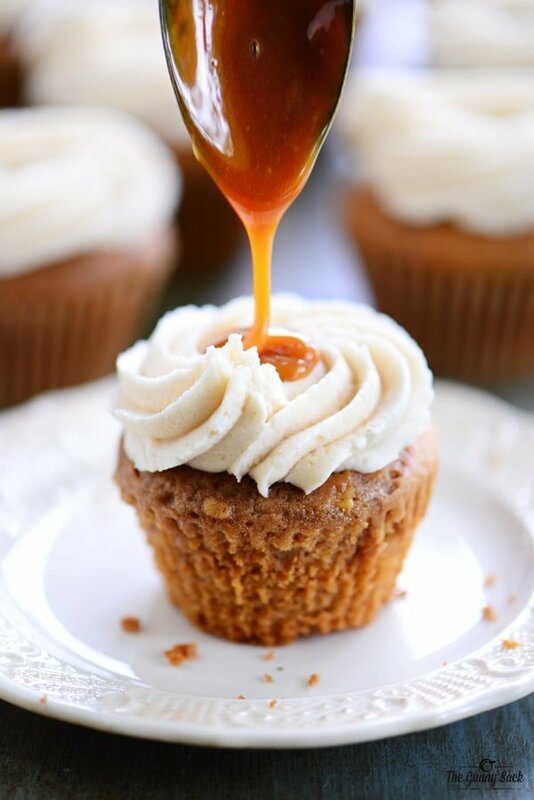 I created this mouthwatering fall dessert recipe for Caramel Apple Cupcakes, with cream cheese buttercream frosting and warm caramel drizzled on top, as part of a sponsored post for Musselman’s Apple Butter. My husband and I went on a vacation to North Carolina to celebrate our 20th anniversary. While on vacation, we went to a bakery that sold only cupcakes. They specialize in cupcakes that have a warm sauce that you pour over the cupcake and it melts the buttercream frosting turning it into a really special treat. I was so inspired by all the cupcakes that I had to try some of my own versions. With the cooler temps and beautiful fall colors on the trees, I am in the mood for apple recipes, so I decided to make Caramel Apple Cupcakes made with easy apple cupcakes, cream cheese buttercream frosting and warm caramel sauce drizzled on top. 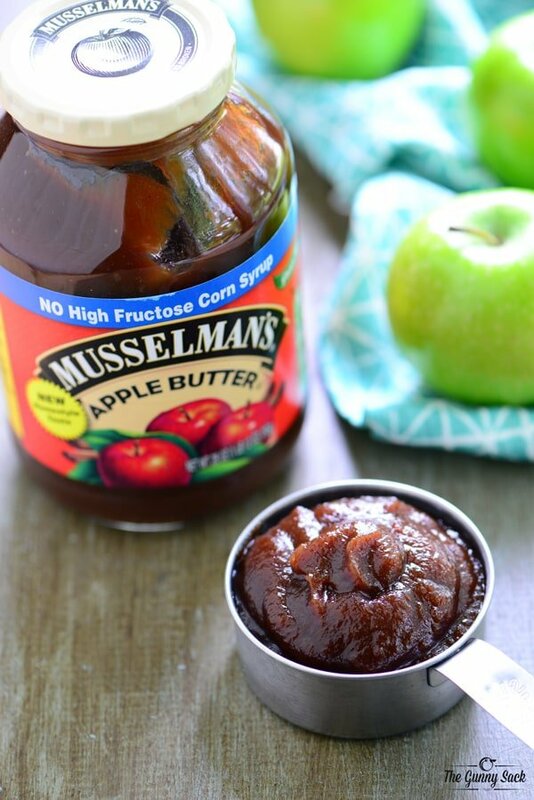 As a Musselman’s Apple Butter Ambassador, I knew that Musselman’s Apple Butter, made with American-grown apples, would be the perfect thing to add to this recipe. Apple Butter is more than just a spread! It is a versatile ingredient that can enhance both sweet and savory recipes with it’s great, unique taste. 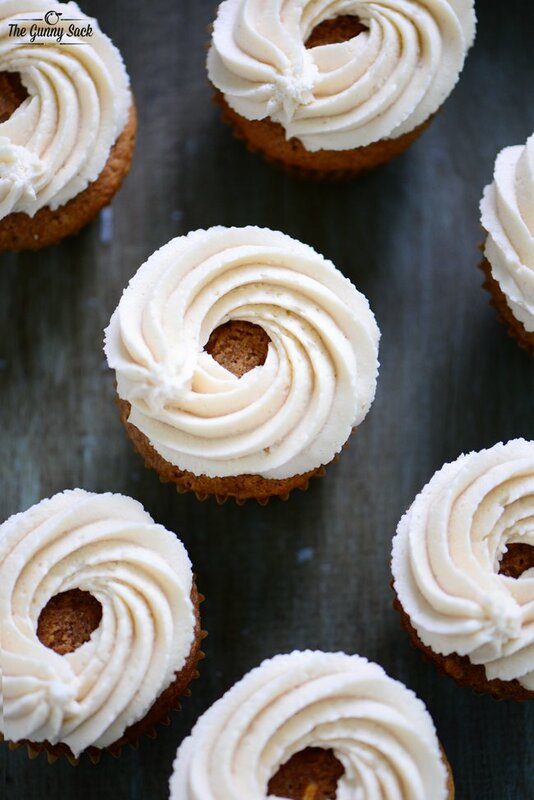 This recipe features Musselman’s Apple Butter in both the cupcakes and the frosting. Mix together the spice cake mix, Musselman’s Apple Butter, apples, oil and eggs for 30 seconds on low speed and two minutes on medium speed. Divide the batter between 24 muffin cups that have been lined with cupcake wrappers. Fill each about 2/3 of the way. Bake at 350 degrees for 20-24 minutes until a toothpick inserted in the middle comes out clean. 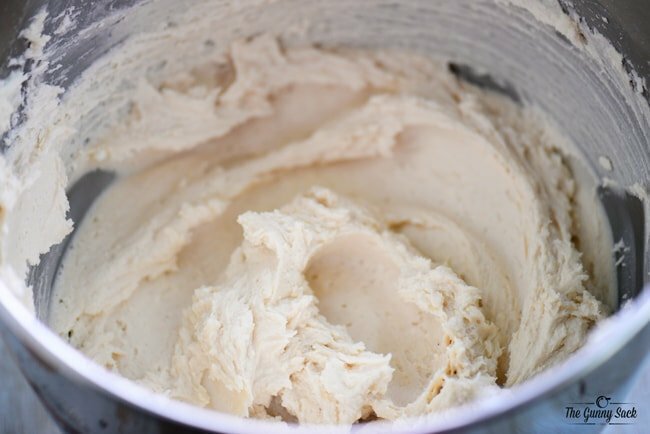 To make the buttercream frosting beat the softened butter, shortening and softened cream cheese until light and fluffy, about two minutes. Mix in the powdered sugar one cup at a time. Add the Musselman’s Apple Butter and beat until light and fluffy. Once the cupcakes have cooled, frost them with the cream cheese buttercream leaving a well in the center. I used a large open star tip to pipe on my frosting. If you don’t have a tip to use, you can spread the frosting on with cupcakes with a knife or pipe it on using a plastic baggie with the corner snipped off. Before serving, warm the caramel ice cream topping in a microwave-safe bowl. Spoon the warm caramel into the well in the center of the frosting and drizzle it across the top. 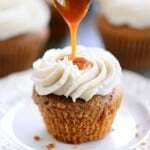 The combination of the soft, moist cupcakes with creamy, buttercream frosting and warm caramel on top was fantastic. We shared these cupcakes with my sister and her family and everyone loved them. 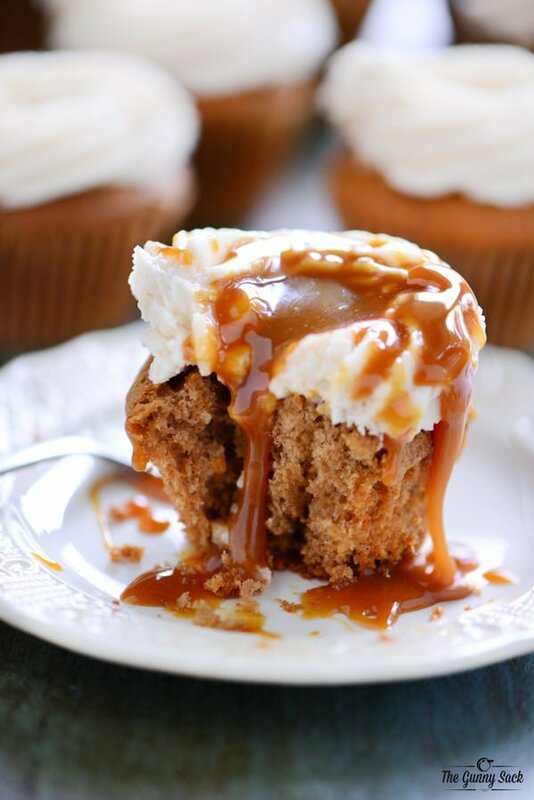 These Caramel Apple Cupcakes are definitely a new favorite fall dessert! Mix together the spice cake mix, apple butter, apples, oil and eggs for 30 seconds on low speed and two minutes on medium speed. Divide the batter between 24 muffin cups that have been lined with cupcake wrappers. Fill each about 2/3 of the way. Bake at 350 degrees for 20-24 minutes until a toothpick inserted in the middle comes out clean. Once the cupcakes have cooled, frost them with the cream cheese buttercream (recipe below) leaving a well in the center. Beat the softened butter, shortening and softened cream cheese until light and fluffy, about two minutes. Add the apple butter and beat until smooth. If you are unable to find spice cake mix, you can make your own by whisking together one yellow cake mix, 1 tsp ground cinnamon, 1/2 tsp ground nutmeg, 1/4 tsp ground allspice and 1/4 tsp ground cloves until combined. What type of apples do you use? How small do you cut them? 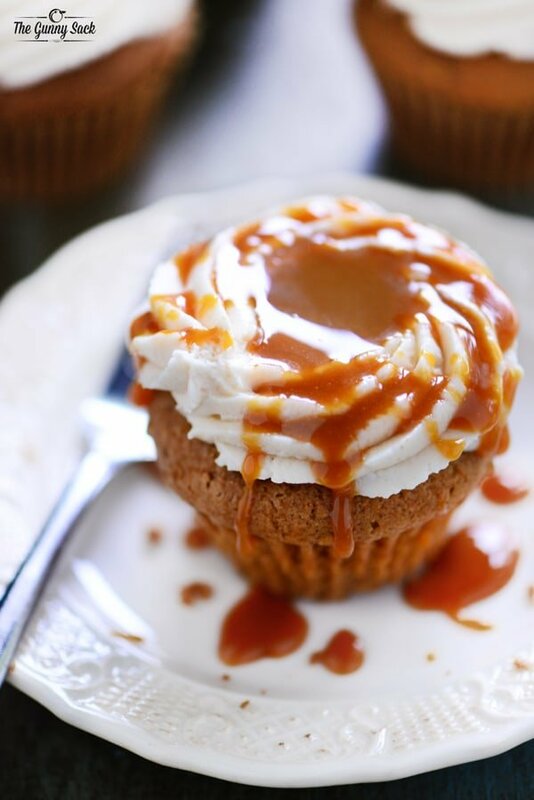 Can you add the caramel as a filling inside the cupcake? Hi is there a reason for such a large amount of powder sugar in the frosting? Normally I use 3-4 cups in other recipes. I have to agree. I made these as written and must say, even my children found them to be gross… Just way too much of everything really and had to take most of the icing off. It also only makes 24 cupcakes and the icing mix makes way too much icing; “for” close to probably 50 to 60 cupcakes. So there’s a lot of waste left over too. Had to take off most of the icing and added more cream cheese to what I had left and re- iced them again. Oh my gawsh, that looks sooooo good! LOVE apple butter! Girl, these cupcakes look amazing with that apple butter! And the caramel. Be still my heart. 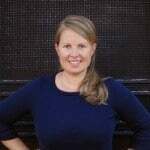 Why do I visit your site in the morning when I’m starving? Could these be made ahead of time to take to a party?? Yes but don’t add the warm caramel until right before serving. You could even put the syrup in a pitcher! This is pure decadence! I’ve never had this apple butter before but now I’m intrigued to try it. Thanks for inspiration. Can’t wait to get started on my apple recipes! Happy anniversary!! And these cupcakes. Oh my! They look incredible! Happy anniversary! These cupcakes look incredible! Love the warm caramel topping! That looks like the best apple butter in the world. Love the buttercream you created using it. The whole cupcake screams fall! 20 years?! Congrats!!!! I love using apple butter in cooking (and have used it in pancakes before.) 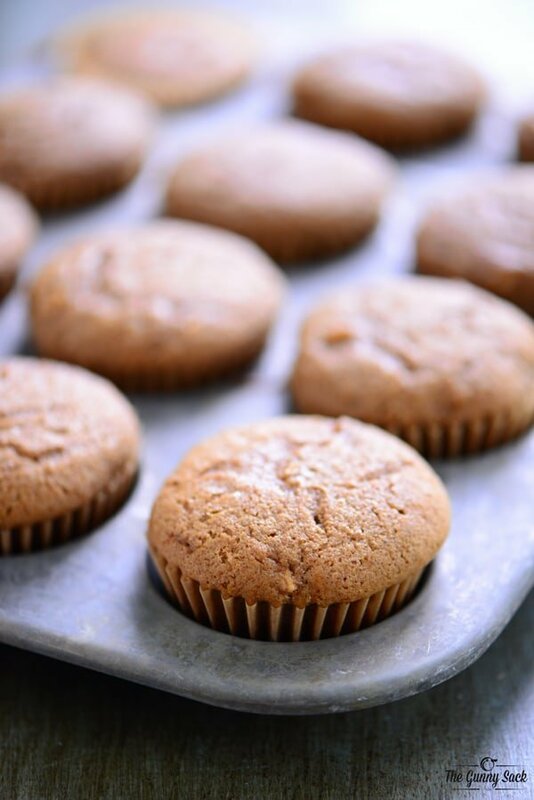 I have stuffed my cupcakes with apple butter but never used it in the batter! Have to give this a try! Thank you Kacey! I feel very blessed! Ohhhh…I love the sound of apple butter in pancakes! I can’t wait to try that one this fall! Looks heavenly! I never would have thought to put a warm sauce on my cupcake. I have to try this! Seriously…you HAVE to try it! It’s soooo good! Thanks Rachel!